If you missed this year’s installment of Marin Master Gardener articles in the Independent Journal, not to worry. They are all archived by year for you to catch up. 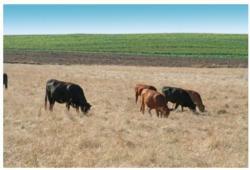 “California’s rangeland water quality management plan: An update was published in Rangelands to summarize the progress and accomplishments of the UC Cooperative Extension’s ranch planning partnership with livestock ranchers. “M.B. Boissevain Marin’s First Farm Advisor – Historical Photographs of Marin’s Agrarian Roots: 1920-1950” presents the images taken by Marin’s first Farm Advisor of Marin’s farm families from the 1920s to the 1950s. Grown In Marin News migrated to an online version, providing quarterly updates on the latest activities and news from Marin’s agricultural community. “Can My Tree Catch the Flu?” is an interactive animation youth activity for forest health. Our team served as editor for the “Proceedings of the fourth international workshop on the genetics of host-parasite interactions in forestry: Disease and insect resistance in forest trees” – USDA Forest Service conference proceedings. Learn about the results from a recently completed research needs assessment for Sudden Oak Death in “Evolution of an invasive species research program and implications for large-scale management of a non-native, invasive plant pathogen”. Read about what you can do with firewood to protect our forests from disease in the California Agriculture article - "California Firewood Task Force's message: 'Buy it where you burn it'”. In North Bay Artisan and Farmstead Cheesemaking Resources you will find a comprehensive summary of publications, organizations, and online resources for on-farm cheese making. Agritourism in Marin is the place to start when you want to learn about the opportunities to see agriculture in action by visiting Marin’s farms and ranches. These include farmstead cheese makers, oyster growers, and grazing livestock producers. Use the “Firewood: Don’t get burned” public service announcement as part of a discussion on our responsibility with firewood to prevent the spread of forest diseases. Additional resources for teaching about firewood and the spread of forest diseases are available through Buy it where you burn it. Learn about “Can My Tree Catch the Flu?” and interactive animation and other online youth activities, through this UC Delivers story.